Brave Raideen (勇者ライディーン) aired from April 1975 until March of 1976. The Jumbo Machinder was released in 1975. Other Jumbos released that year were the Getter G team, Getter Dragun, Getter Liger and Getter Poseidon and all three toys were packaged in boxes featuring strikingly similar artwork. Although Raideen has no other connection to those robots, it seems almost like they are a set unto themselves due to this similarity. Raideen (also sometimes spelled "Reideen" or "Raydeen") must have been produced in great numbers because it remains one of the most easy to find Jumbo Machinders from the whole line, along with the first two releases, Mazinger Z and Kamen Rider V3. There are always loose specimens on Yahoo!Japan auctions and I think practically every shop I went into on my last trip to Tokyo had at least one, many with the boxes. It's been said that this toy even had a limited release in the US, which seems likely since it does show up on ebay from US sellers occasionally. The original Japanese version of the toy (Raideen was released by two other companies, Mattel in the US and Europe and Jugarama in Mexico) is by far the best one to get. It's proportions are much nicer than any of the subsequent releases and the bow fist is a favorite among fans who grew up with the much less attractive Mattel Shogun Warriors version. This guy sure seems enthusiastic about the toy! Reideen comes with wheels on it's feet, removable hands and winged missiles that it shoots from it's stomach. This missile is unique to this Jumbo. This missile is usually yellow, but JoshB (who owns the specimen pictured in this review) has seen at least one missile that was cast in blue. In the anime, Raideen could transform into a flying "God Bird" mode and you can represent this by turning the robot on it's side. Ok, ok, you gotta use your imagination a bit for that one.. 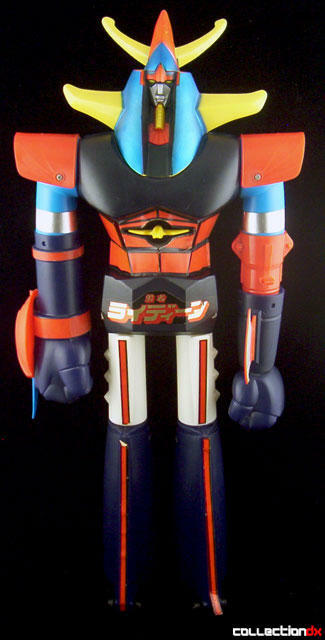 Besides being released by Mattel and Jugarama, this main body sculpt of the Raideen Jumbo Machinder was also used on other toys. 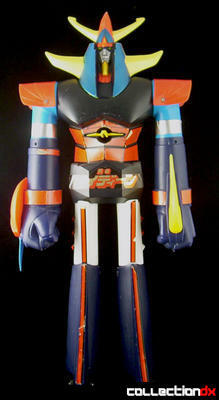 The Mazinger Z jumbo from Argentina uses the torso while the Argus toy from Brazil uses both the torso and the head. 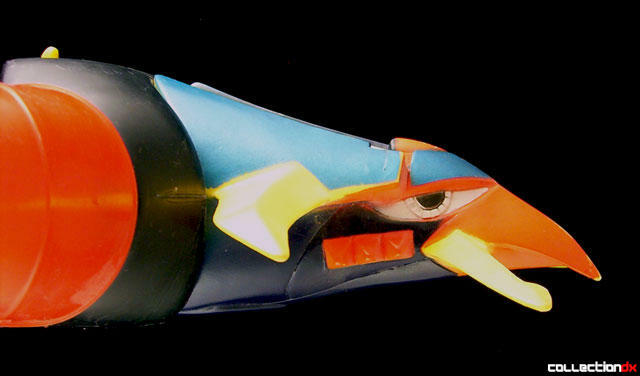 There is also a very cheaply made Mazinger Z from Mexico that uses the entire body of the Raideen Jumbo but replaces the head with a crudely sculpted Mazinger Z head. Truly, toy makers got their money's worth out of this mold! Even though he is so easy to get, It was a very big deal for me when I got him, my first "Japanese Version" vintage Jumbo Machinder. The differences between this version and the US version are subtle but different enough to make this worth getting. I had one of these that I got used, so I hadn't the faintest clue what it actually was (I had never heard of the reideen anime/manga nor the shogun warriors at the time). The lower part of the left arm was missing, (as was the missile), so I don't know whether it came with a bow arm or not. It did have the gold "belt" sticker, and the red diamonds on the sides of the legs though, so I believe it was this japanese version. The head was made of a soft rubbery plastic, in sharp contrast to the rigid plastic of the rest of the toy.